A Village Fair Essay. Welcome to our website. This is the one of the best and an unlimited the source of Essay and Paragraph. 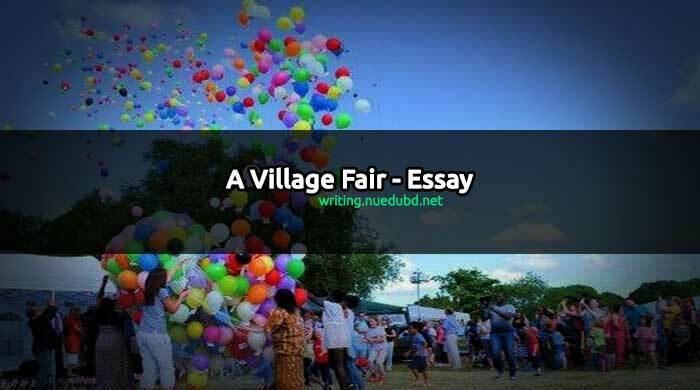 Now NU EDU BD writing section sharing the most useful A Village Fair short Essay for you. I hope you'll like it. Education is one of our basic rights. Now check this out. Here is Very Short and Easy Essay for you. Introduction: The fain means to meet together. A fair is a great attraction for the villagers. It creates the chance o meeting for the village people. A village fair is a tradition of the village. What is a village fair? : A village fair is a fair which is held in an open place either on the bank of a river or in the yard of a temple. It is held annually in a village. It is a large gathering,. In keeping with the tradition, a village fair is arranged. Occasion and duration of the fair: The village fair is held on the occasion of some religious festivals or Pahela Baishakh. It is also held on the death anniversary o any saint or to celebrate any age-old day of historic importance etc. generally a village fair lasts for a day or two. Sometime it may last for seven or eight days together. Gathering of the villagers: In a village fair, a lot of o people gather together. The rich and the poor, high or low, saints and sadhus, young and old, children and women assemble here. It becomes a meeting place. People forget their differences and enjoy much at a fair. Things bought and sold: A village fair is a sort of mini-exhibition. A lot of things are exhibited here. Fancy goods, sweet-meats, toys and wooden things are mostly sold. In a village fair different types of tasty things satisfy our appetite. Fruits of different species are sold here. Children gather in the toy-shops. The ladies gather in shops of cosmetic and handmade things. Small traders from far and near come to sell their products. Thus a village fair becomes the show of multifarious things. Attractions: A village fair has a lot of attractions, Many forms of amusements are available here. Traveling, magic parties, Jatra parties circus parties, doll-dance, merry-go-rounds etc. are the main forms of attractions. The people amuse themselves enjoying these parties. Importance: A village fair has immense importance. The village people can amuse and refresh themselves. They get their necessary things. The village fair is a source of economy for the villagers. They sell their products and can earn money. A village fair encourages the small cottage industries. The people are motivated to improve their products. Again the fair has social value. It shows the sincerity and simple-minded relation of the villagers. Defects: A village fair is not free from drawbacks. Sometimes it becomes the center of jugglers. They exploit the innocent people. A fair becomes dirty. Pick-pockets are found. Sometimes the customers are deceived by the sellers. Conclusion: A village fair is a source of great refreshment for the villagers. It is a meeting place. The people wait for its arrival. They take a fair in their heart.